Did a UFO cause this plane to crash in Argentina? A mysterious crop duster crash in Argentina has yielded bizarre evidence of a UFO! See it there, in the upper right corner of the picture? Could aliens be trying to send us a message about the problems of factory farming? An unidentified flying object - presumably a "flying saucer" - was photographed by a journalist from Santa Lucia while taking pictures of the crop duster that crashed in the locality of Gobernador Martinez for the second time in a 24 hour period. While uploading the images of the small plane's collision, he did not notice anything unsual. But a reader . . . [noticed a] strange object in the upper right hand margin, where what could be a UFO appears over the shattered aircraft. There is no question that what happened to the small aircraft is strange, as it fell to earth twice in a 24-hour period, the first due to an alleged fuel failure, even after the pilot had checked that no failures were present. 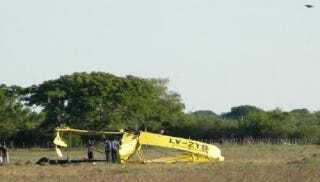 The second event occurred when the aircraft plummeted to the ground some 4 kilometers away from Paraje San José.